Most people know that our Santa Claus today originated from St. Nicholas, but the derivation of the Santa Claus story comes from many sources. In fact, since the Catholic church in 1969 demoted St. Nicholas from his official saintly status ~ as there were no records of his having been canonized ~ the original legend of this fourth century bishop is not very widely recognized as part of our Christmas celebration. Nicholas was born into a wealthy Greek family living in the city of Patera, in the south of the Anatolian Peninsula (now known as Turkey), in western Asia. Legend claims that on the church's fast days, Wednesdays and Fridays, the infant Nicholas nursed only after sundown. Just one of many stories demonstrating his holy reputation is about an angel who appeared to the cardinal appointing a new bishop for the town of Myra, with a face bright like the sun, who told the cardinal to ordain the 30-year old Nicholas. Through his priesthood in the early Christian faith, even while alive he came to be recognized for his generosity to all those in trouble. In his good-doing role as priest, one story tells of Nicholas, who took pity on a girl in his parish whose family had no dowry. Had Nicholas not intervened, this would have prevented her from marrying. He made a parcel of money from his family's coffers and donated it anonymously to the young woman and her future by throwing it in through the open window, where it is said to have landed in her stocking. This type of event occurred more than once, and Nicholas became known for late night gifts, and the granting of wishes. A miracle of his legacy is the story of three young students who were robbed and dismembered on their way home from school, and stuffed in a pickle barrel. Nicholas is said to have appeared out of nowhere, and the boys arose at his command, intact. Once the story of his deeds spread, he became widely known for helping those in trouble: lawyers and their clients, pawnbrokers, and sailors, as he was invoked to calm turbulent seas. And he became the patron saint of children. From his original tomb, a viscous myrrh-like material is said to have oozed that was used by pilgrims as an ointment, to heal sickness. By 1082, his body was removed by grave robbing sailors, from where it was initially interred in Asia Minor, and moved to Bari, Italy, where a cathedral was built in his name. For centuries there were more churches in the middle ages named after him than all the apostles, and next to Christ and the Virgin Mary, St. Nicholas was the next most popular figure in Christianity. In a French village during the 12th century, local nuns honored their patron on December 6, which became St. Nicholas Day. The nuns delivered candy to all the children who'd been good, leaving it for them in their shoes, and leaving switches in those of the naughtier children. Because they seemed to cover so much territory, some began to say it was St. Nicholas himself who delivered the gifts. By medieval times Nicholas had become the most beloved patron saint of Europe, and through the middle ages, the story of Christmas in Europe developed to combine religious and pagan myths. German culture told of the ancient god Voden, the mystical sky rider who would pass judgment over villages to determine who did well, and who did not. In the 16th century reformation, Martin Luther's strong Protestant church banned St. Nicholas, denouncing his popularity as a saint because it rivaled the worship of Jesus. When Luther created the Protestant church, he realized it would be necessary to wean German children off of St. Nick, so he created Krist Kindle, the winged Christ cherub, who also flew and brought gifts to good children ~ but which instead focused the celebration around Christ. He came on Christmas Eve at Christ's birthday, which more closely coincides with the Winter Solstice, around which pagan religion celebrated the return of the Sun's light. 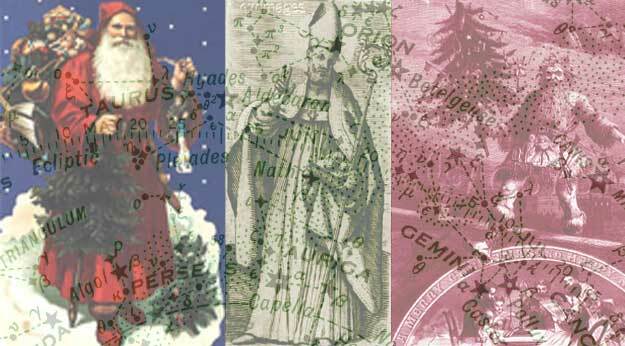 In England the myth developed around Father Christmas, and in France, Pere Noël. Italy's old hag Bafana, out looking for the Christ child, left gifts in her wake for other kids. The gnome Tompten was Sweden's figure, and in the U.S., Martin Luther's Krist Kindle became Kris Kringle. It was Dutch sailors who came to the New World and would not give up St. Nicholas as their patron; when they settled, particularly around the New York area, their nickname Santer Klause became the name we know as Santa Claus. In early colonial times around the American Revolution, the new American culture embraced most all that was not British, and so took on the Dutch Christmas celebration honoring their beloved St. Nick. Washington Irving gave the Dutch culture prominence in his "Knickerbocker Tales," which he wrote for the New York newspaper press. He mentions St. Nicholas over two dozen times in his chronicle, and it is from these writings that the original story "A Visit from St. Nicholas," better known as "The Night Before Christmas," was conceived. The poem came to Clement Clark one night before Christmas when he was riding in a horse and carriage through the snowy streets of New York City, and so went home and wrote it for his children. 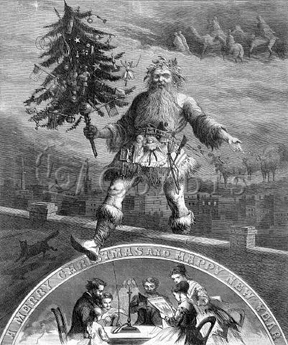 St. Nick came to be depicted as a jolly man in the more familiar red suit and white beard, and Harper's Weekly publisher Thomas Nast printed drawings that brought these images to the public. By this time, St. Nicholas' bishop's staff had become the more pagan candy cane. Other popular writers in the 1800s also published variations of the Santa Claus story, and by the 1890s, the first department store santas had emerged. By the 20th century, Santa Claus was here to stay.